One of the first of a generation of more luxurious leslieville loft developments,“The Garment Factory Lofts” is a fantastic conversion! We love the way the new portion (The top 4 Floors) is setback giving everyone a lot of outdoor space. The original four stories have been converted to lofts with restored concrete floors, large warehouse windows, and exposed concrete ceilings of 11 ft+. Its like 2 buildings in one, the lower floors are the more original “hard loft” style and the upper floors have a more modern feel. We hold this building close to our hearts as we have sold more suites than any other salespeople here and we watched the building being built from its inception. 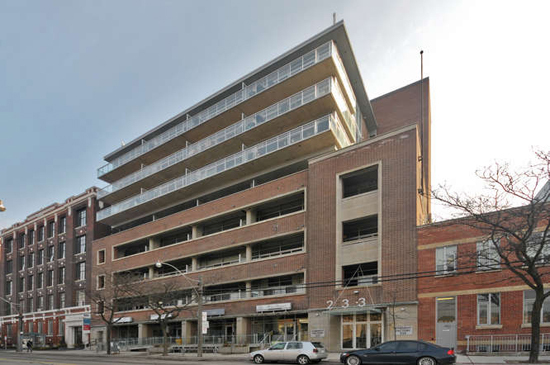 From a location perspective, its close to funky Queen Street East shops, and very quick to downtown via TTC and car. The suites range in size up to 1303 sq ft of interior sq feet, and all feature gas ranges, gas lines of balcony, soaring ceilings and stone counter tops.